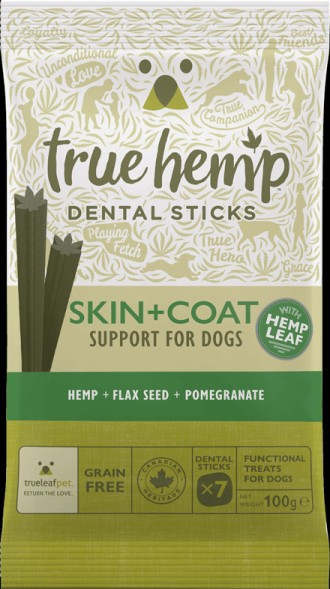 True Hemp Dental Sticks formulated to help improve and maintain skin and coat conditions in dog's. Nothing says ‘True Hemp™ SKIN+COAT’ like soft skin and a shiny coat! This formulation contains a blend of ingredients in a dental-stick format to help keep teeth clean and also provide Omega 3 essential fatty acids, which play a critical role in normal skin function and appearance. Composition: Pea starch, Potato starch, Glycerin, Fresh Chicken (6%),dried salmon protein (4%), Hemp leaf (dried and ground 4%), Hemp seed (ground 4%), Pea protein, Salmon oil (2%), Zeolith (1.5%), Hemp oil 1%, seaweed (dried 1%), pomegranate (dried 0.75%), flaxseed (0.5%), Sunflower protein (0.5%).